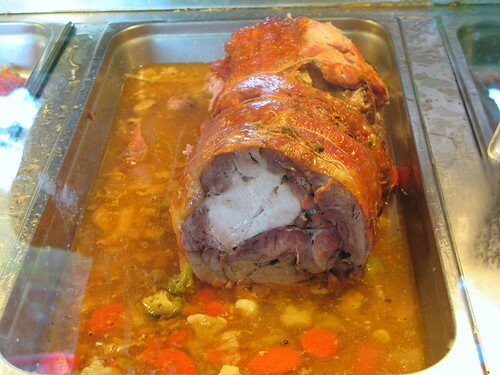 It had been deboned and stuffed back into its own skin and then roasted. 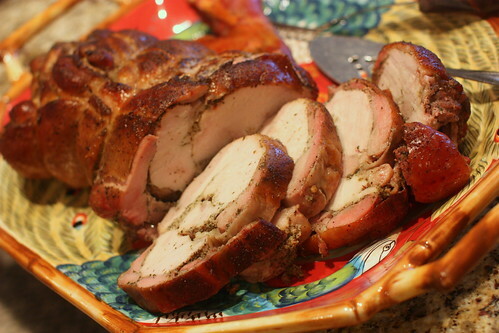 This got me thinking — what if we took Daisy’s recipe, de-boned it, and then smoked it on my Weber Bullet, so it would really taste like slow roasted turkey over charcoal? Then it would be BARBECUE! And Puerto Rican at the same time! 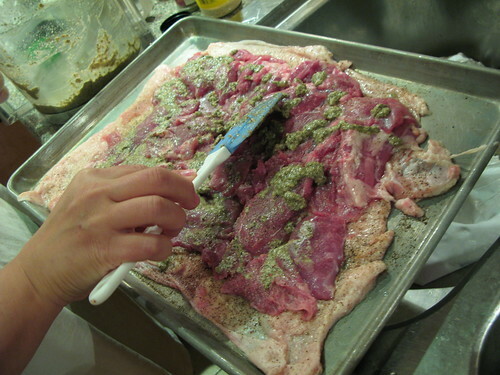 We then seasoned this with Adobo Seasoning Mix, cumin, and fresh ground black pepper. 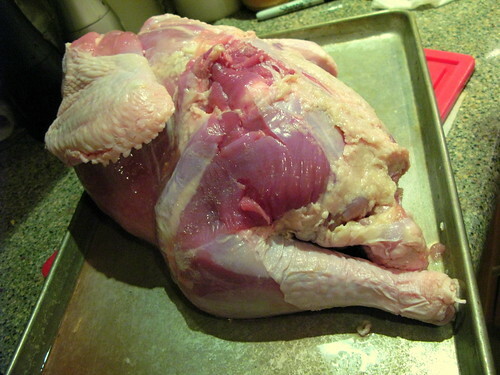 We then removed the legs and wings from the turkey. Keep the wings aside and roast them separately, they are a great treat to keep for yourself as a snack later on when everyone goes home. 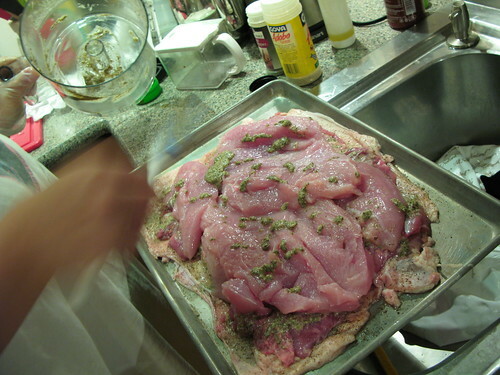 And removed the breast meat, leaving just an empty carcass. You can now throw him in a stock pot and make soup. 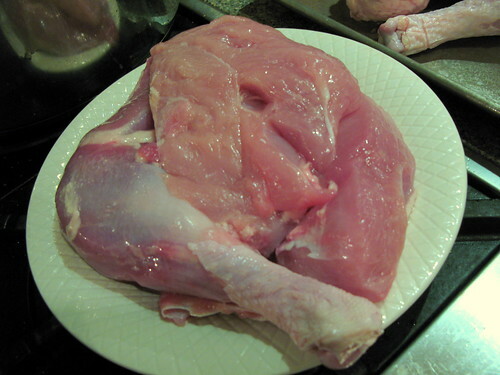 After removing the legs and the breasts, cut all the dark meat off the legs and throw the bones into the stock pot with the carcass. 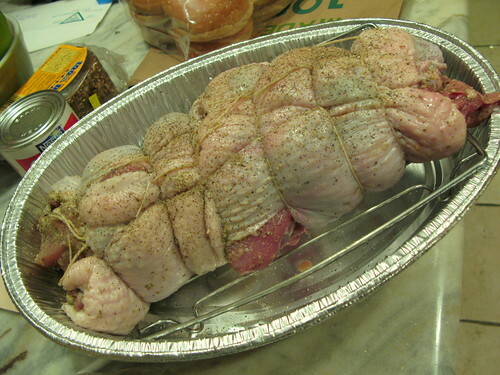 Layer the dark meat onto the Turkey skin, and hit it with some more Adobo seasoning and cumin and black pepper. 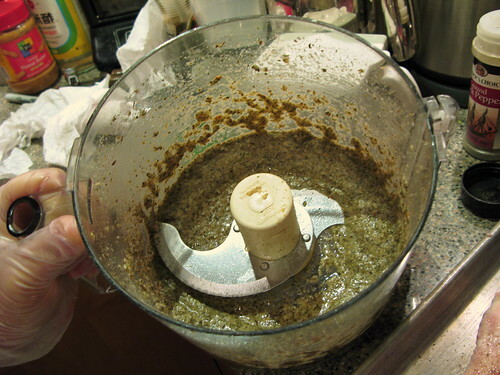 In a food processor, make 1 recipe of Daisy’s Wet Adobo. Spread the Wet Adobo on the dark meat. Now layer on the breast meat and do the same. 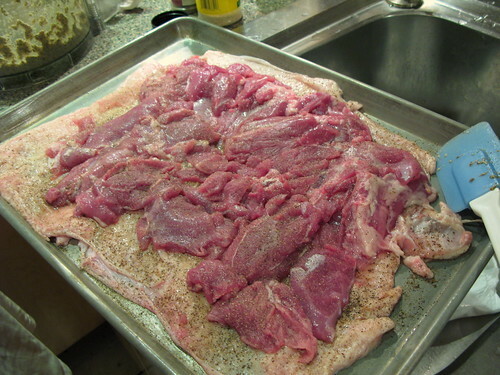 You might need to slice up the breasts so they lay more flat and even. 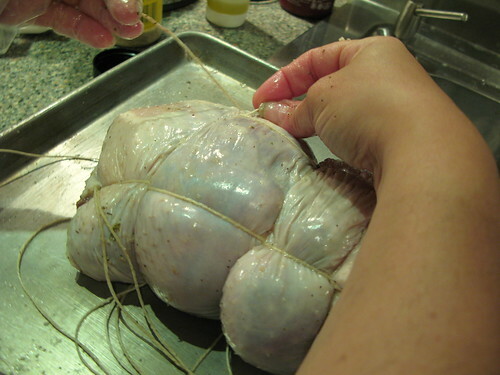 Now, using butcher’s twine, truss up the turkey like a Pork Roast. Here’s a video of how to do this. 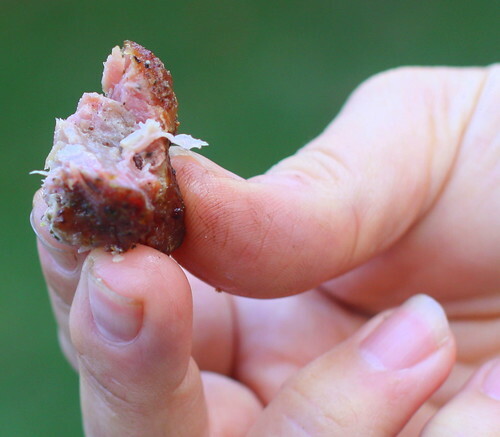 If a bit of the dark meat comes out the skin, its not a big deal. Here’s a close-up of the knotting process. This is how it should look when you are done. 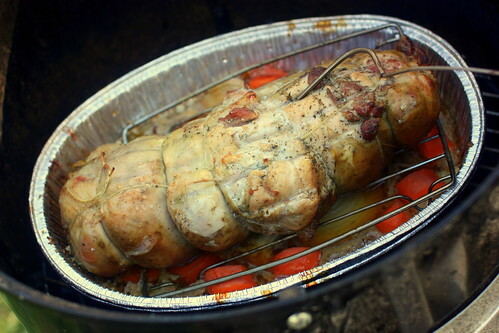 The roast is now sitting on top of a roasting rack in a disposable aluminum double roasting pan. Put some more Adobo seasoning and salt and pepper and cumin on the top for good measure, cover this with plastic wrap and let him sit in the fridge to marinate for 2 days. 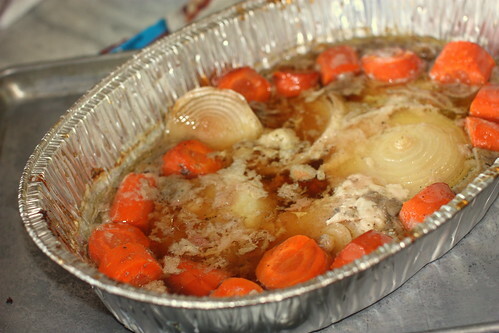 When its time to cook the roast, put your root vegetables (Onion, Carrots) in the bottom of the aluminum pan. 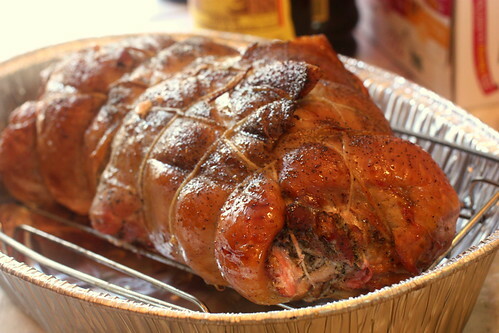 I used a Weber Bullet to smoke the roast over charcoals and hickory at approximately 225 degrees for 3 1/2 hours, or until the internal temperature of the meat was around 155 degrees, which is par-cooked, because i was going to transport it to my in-laws and re-heat it in the oven at 325 for about a half an hour. If you are going to fully cook the turkey in your backyard grill, it should probably take about 4 to 4 and a half hours, or until the temperature of the meat with a probe reaches 165 degrees. Here’s a little bit of dark meat we grabbed off the roast. That pink color comes from the smoke. Here’s the pan juices. We thew the whole lot into a blender with some additional stock (remember that carcass you cooked?) and made it into gravy. Here’s the Pavochon, just out of the BBQ Smoker. Here’s the table at my in-laws, set and ready to go. 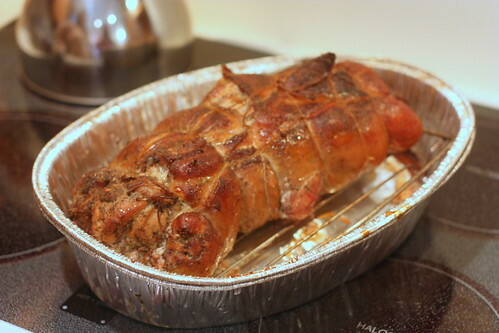 Here’s the Pavochon after being re-heated in the oven. 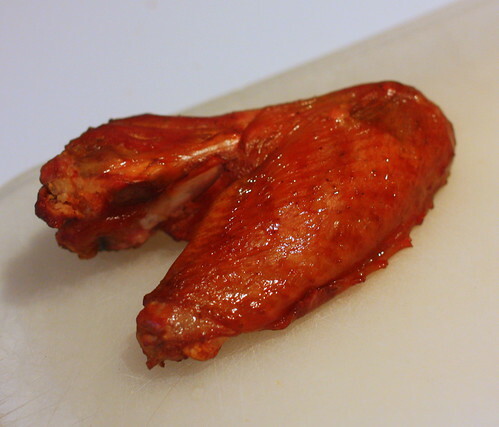 Smoked Turkey wing, for mom. 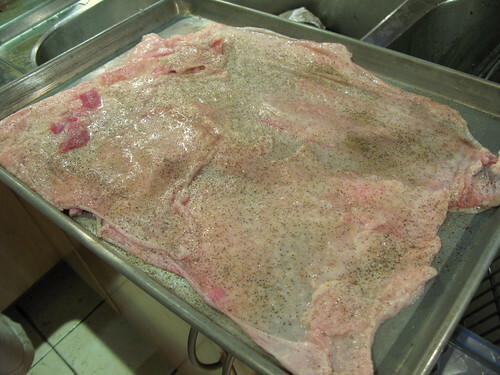 Here’s the Pavochon sliced up, in all of its glory. What do you serve Pavochon with? 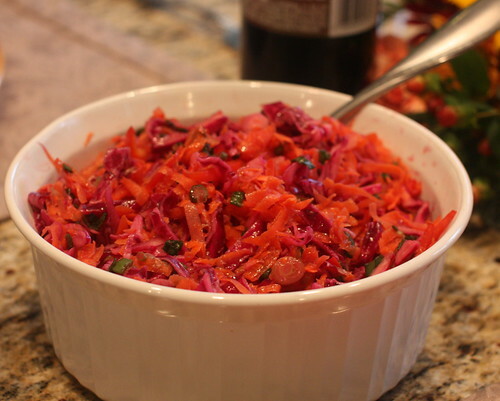 Well, we wanted to amp up the vegetable content with this meal, so we decided to whip up some “Boriqua Slaw”. 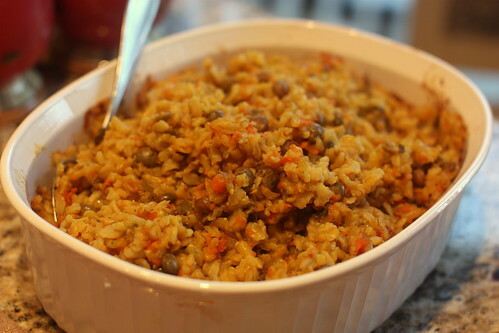 This is not a traditional Puerto Rican dish, but its great for a salad course and is a great use for Daisy’s Pinapple Vinagre. 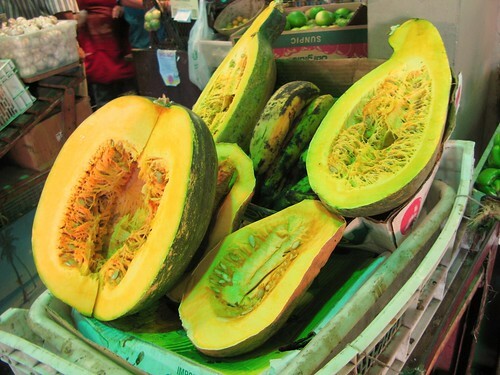 Here is a variety of Calabaza that is sold in Puerto Rico. You can find other varieties with different flesh colorations. Some of the ones that come from other countries have very bright orange flesh. Some of these are so big that they have to sell it in peices wrapped in plastic wrap. Here’s the soup, a Caldo Gallego, which is a traditional soup from Galicia in Spain similar to an Escarole and Bean soup. 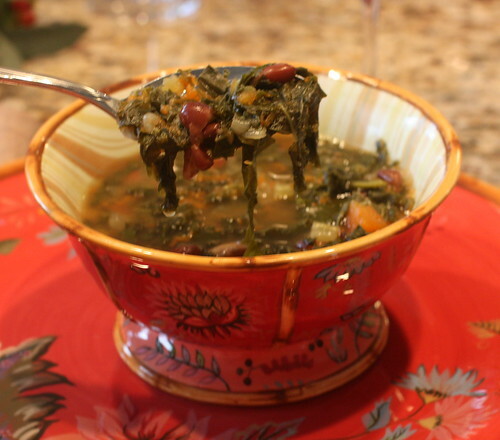 This was made with the Turkey Stock from the deboned turkey, beans, cubed Calabaza, Chicken Andouille sausage (traditionally it calls for Chorizo) and lots of Kale. 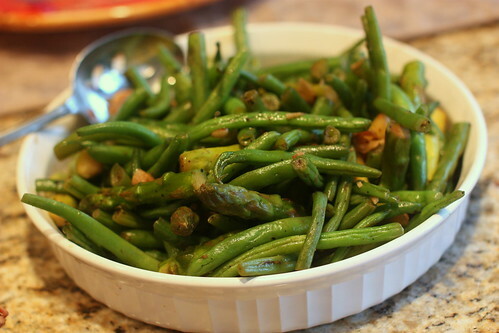 Heres a plate of Asparagus and Green Beans sauteed with Garlic. Gotta have your veggies! 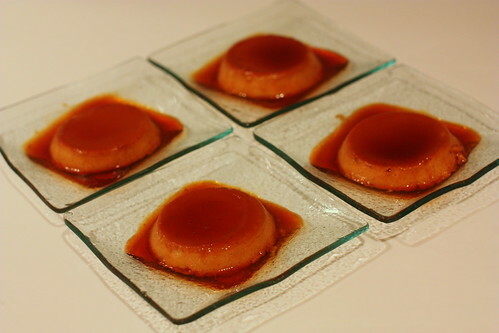 For dessert, Pumpkin Flan made with Calabaza. 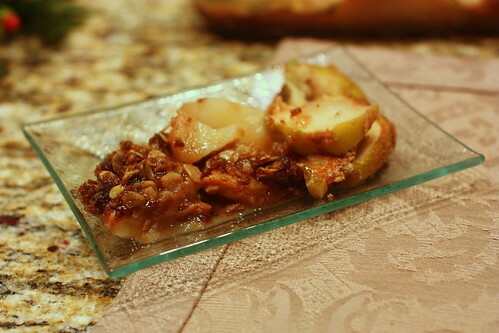 This was based off of Ellie Krieger’s recipe from Food Network. Pretty much exactly the same as her recipe, but we used leftover cooked and strained Calabaza instead of canned pumpkin. And for dessert #2, Rachel’s Mom’s Apple Crumble. 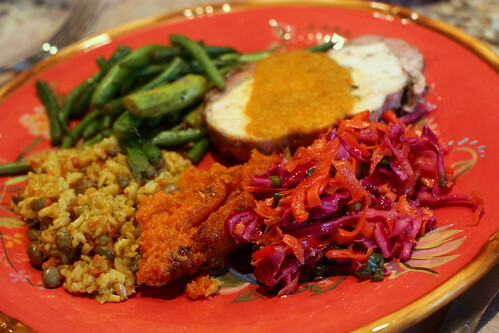 This entry was posted on Monday, November 23rd, 2015 at 12:30 pm and is filed under Food. You can follow any responses to this entry through the RSS 2.0 feed. You can leave a response, or trackback from your own site. Good lord, man! That Pavochon is a thing of beauty and might possibly cause me to reconsider my anti-turkey stance. 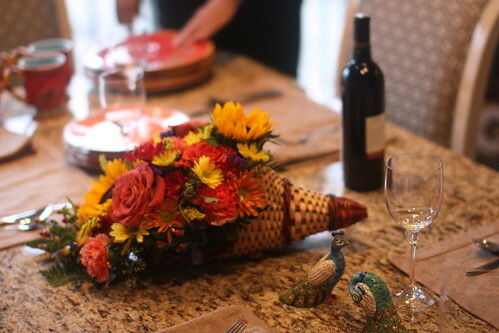 Happy Thanksgiving, and thank you for all of the great restaurant reviews throughout the year. You’ve introduced us to some fabulous, new (to us) places.